I feel like this is the month of Star Wars. Only fitting with The Force Awakens premiering. My only complaint this month for Fandom of the Month is that it didn’t come in in time for me to wear stuff to the premiere. Which is OK… I had gear already picked out. There’s no way a Star Wars themed box is gonna lose when it comes to this house. For real. Tell me that’s not beyond awesome? Wookie Magnet: Chewie can now judge my eating decisions from his place on my freezer door. 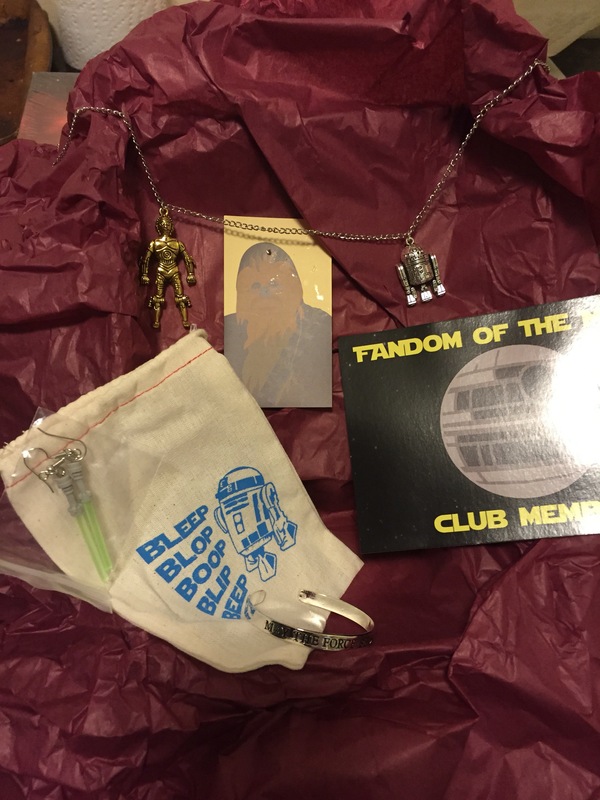 Droids necklace: I’ve been enjoying C3-P0 on my Waze app and now I can have my droids with me everywhere I go. I like it. Lego Lightsaber earrings: I laughed. It’s like two fandoms in one! What’s better than Star Wars? Freaking Lego Star Wars, that’s what! Droid bag: I have to find something special for this bag. That’s just awesome. I paid 17 bucks for this with shipping. Not bad! Those earrings alone made my day! What’s your favorite Star Wars wearable?